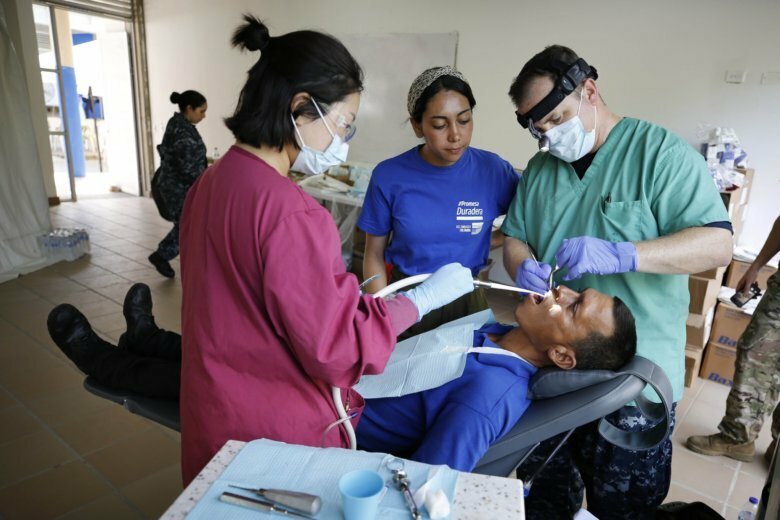 RIOHACHA, Colombia (AP) — Venezuelan migrants aboard a U.S. Navy hospital ship were undergoing surgery Tuesday for everything from tooth extractions to hernias that have proven difficult to treat both in the country they fled and the one receiving them. The USNS Comfort is docked off Colombia’s coast near Venezuela and taking aboard hundreds of both Venezuelan and Colombian patients during its four-day mission to a region that has been an epicenter for migration in recent years. The trip to Riohacha is part of a larger 11-week tour to several Latin American countries heavily impacted by the exodus of Venezuelans, many of whom are driven to flee by lack of access to medicine and treatment in their home country. Niurka Roldan said she left Venezuela with several decaying teeth and a jaw abnormality that she wasn’t able to treat. During her two years in Colombia, she said she’s struggled to make ends meet, let alone afford dental care. “It was very frustrating not to be able to do this in my country, nor in Colombia,” she said. The Navy is taking patients needing surgery aboard the ship while also operating two concurrent land medical sites for minor conditions. In the first day of service Monday, physicians tended to more than 700 patients and completed 39 surgeries. Capt. Kevin Buckley said dental surgeries and operations to remove cataracts and hernias are among the most common procedures being performed — ailments that are relatively simple to fix and can have a big impact on quality of life. “I feel like I’m a father watching my kid ride a bike for the first time,” he said of the joy of watching patients see and live without pain again. The ship’s arrival comes at a tense time for U.S.-Venezuela relations, as President Nicolas Maduro’s government becomes increasingly isolated amid mounting financial sanctions and international outcry over human rights violations. Socialist party leader Diosdado Cabello has likened the U.S. ship to a “Trojan horse” designed to generate fear among the Venezuelan population. Venezuela’s government allowed a Chinese hospital ship to visit the country in September, but generally denies that a humanitarian crisis is underway. Nonetheless, the United Nation’s International Children’s Emergency Fund announced Monday that since August it has delivered 130 tons of medicines, health and nutrition supplies for 350,000 women and children. The U.N. said the supplies were delivered in agreement with the government. The U.N. estimates some 3 million Venezuelans have fled their country in recent years in an exodus that is putting stress on regional governments. Between 2017 and 2018, the number of emergency room visits by Venezuelans in Colombia has increased 202 percent, according to officials. The vast majority have no medical insurance and must go through a lengthy process to qualify for treatment of chronic conditions. Not all Venezuelans who flee are able to get treatment in time. According to Colombia’s National Institute of Health, over 2,000 Venezuelans have died thus far in 2018 from illnesses including malnutrition, malaria and transmittable diseases, among others — up from 863 such deaths in all of the previous year. Roldon, who has a degree in education but now earns a living offering manicures, said she’d learned about the USNS Comfort years before on the Discovery Channel, never thinking she’d one day be among the patients. Associated Press writer Christine Armario contributed to this report from Bogota, Colombia.